The Los Santos Wind Power Project, located in Costa Rica has an installed capacity of 12.75 MW, which supplies energy to approximately 50 thousand people which live near the project. Anaconda Carbon has registered the project with the United Nations and the Gold Standard Foundation, which generates approximately 15,000 tCO2e emission reductions annually. For more information about the UNFCCC registration, please click here. For more information about the Gold Standard registration, please click here. Consists of small-scale hydroelectric projects (> 15 MW) in Costa Rica, Nicaragua and Honduras, this program generates approximately 40,000 tCO2e reductions annually. Anaconda Carbon is the Coordinating Managing Entity (CME) of the program, which is registered with the UNFCCC and the Gold Standard Foundation. NISSAN (Costa Rica) develops a carbon offset program that clean the carbon footprint of the first 10,000 kms of the new cars travel that belong to important government companies like the Instituto Costarricense de Electricidad (ICE), Instituto de Acueductos y Alcantarillados (AyA) and Banco de Costa Rica (BCR). For more information about this offsetting program, please click here. 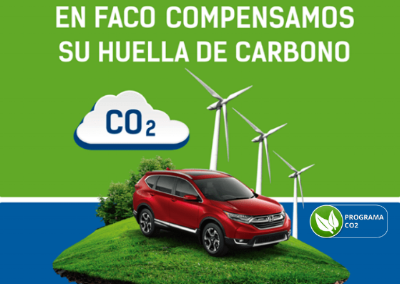 HONDA runs a carbon offsetting program that makes it possible for its clients to carbon offset the first 10,000 kms of each new car purchased, the first program of its kind in Costa Rica and Central America. To this date, Honda has carbon neutralised over 10 million kilometres through this program. For more information about this carbon offsetting program, please click here. AVIA MARKETING (Colombia) implements a carbon offsetting program that allows its clients to engage in sustainable travel and tourism. All flights, car rentasl, hotel stays and events organized with Avia Marketing can be offset through high quality carbon credits offered by Anaconda Carbon. ASUAIRE (Costa Rica) In cooperation with Anaconda Carbon, Asuaire travel has developed a carbon offset program for bus transportation of their cruise lines in the 2016-2017 season, as well as fully offsetting the carbon footprint of its operations using Los Santos Wind Project carbon offsets. OMINA SUMMIT implements has carbon offset of all the emissions generated during the OMINA Summit, including all of the carbon footprint generated by the air travel of its speakers. Omina has opted to utilise carbon credits from the Los Santos Wind Power Project. Additionally, Banco Promerica has developed a program that carbon offsets the footprint of 100 kilometres of road travel for all vehicles used for the assistants of this conference. FAPA CONSULTORES (Costa Rica) has carbon offset their operations throught Anaconda Carbon, using our carbon credits. Also, FAPA offer this service to their clients and partners that wish to develop their own corporate social responsibility programs. EUROPCAR has a carbon offset program that neutralises the carbon footprint of their operations, including the electric power consumption, water use, lubricants, solid waste, paper, refrigerants and carbon footprint of their vehicles. ALIMENTOS TUMBIS (Costa Rica) offers a range food products for export, that are now carbon neutral thanks to their support of the Los Santos Wind Power project.